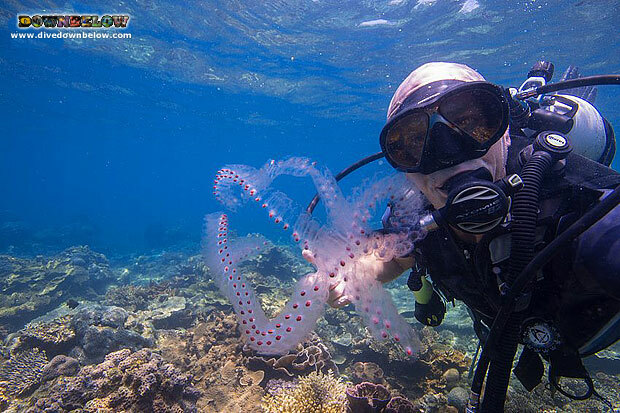 In around April the Downbelow guides are often asked what are these strange floating creatures drifting by during our dives? A Salp is a tube shaped pelagic Tunicate or Sea Squirt & a relation to the benthic Sea Squirts that are common on our reefs here in TARP. They move by expanding & contracting pumping water through their soft bodies freely swimming in the shallows close to the surface. The animal strains the pumped water through feeding filters located inside its body allowing it to consume phytoplankton while drifting with the ocean currents, hence population explosions during algae blooms. Colonies of individuals link together in spectacular huge chains but will eventually break free & enter the independent phase of their lives growing as large as 10cm. When colonial (linked) they will reproduce sexually however when solitary they become asexual. 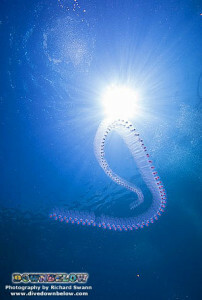 Salps have one of the fastest growth rates of the animal kingdom responding to abundant phytoplankton blooms sometimes consuming so much they sink. Many can been seen washed up along the shoreline or dropping on to the substrate becoming an easy meal as a result of their “negative buoyancy”! 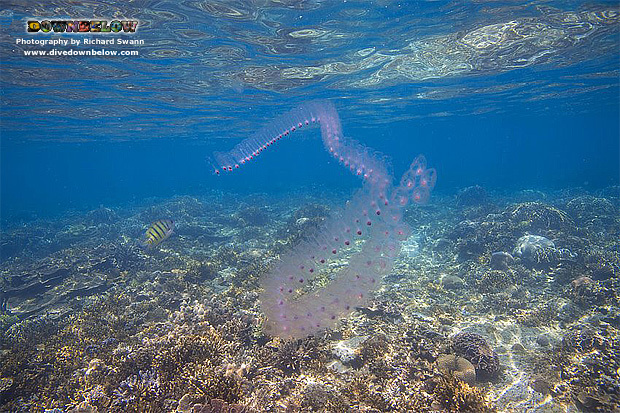 Salps live life in the fast lane & the story ends when the plankton bloom finishes, the food runs out & so do the Salps!